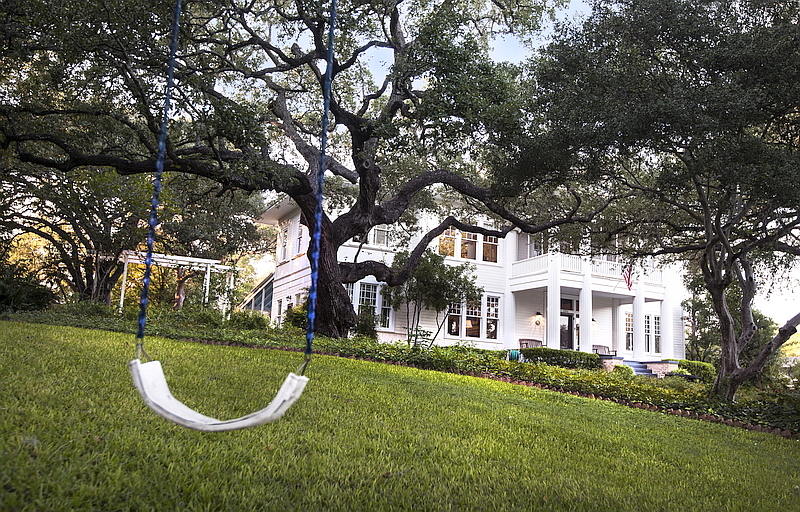 The Fairview is located in a City of Austin Historic Landmark Property, formally known as The Gullett House. The Gullett House was originally built in 1910 by an early Texas cattleman, Mr. Day, for his two daughters. One of his daughters never married so as a “spinster” as she would have been called in those days, it was more appropriate for her not to live alone. She lived with her sister who was married to Mr. Wilkins. We believe that the unmarried sister used two of the upstairs rooms, currently our Pecan Room and Bluebonnet Room, as a living suite. The Pecan Room with it’s “sleeping porch” was most likely her bedroom while the connecting Bluebonnet Room would have been a parlor where she could entertain visitors separate from the rest of the house. Mr. and Mrs. Wilkins would have of course used what is now the Live Oak Suite as their master bedroom. In 1910 they sold the house after one of the three developed arthritis and could no longer easily climb the stairs. Fortunately for them, the sisters father, Mr. Day, was still feeling generous so he built another house on nearby Hillside and that home backs up to our property. The next owners were Tom and Lilly Gullett. Mr. Gullett was a Managing Principal of an Austin school, meaning he served as a school Principal and managed other Principals, kind of the equivalent of a school district superintendent today. They lived in the house for several decades. Following that the history of the house is not very clear. At one time it may have been recuperative housing for military veterans, and later was converted into apartments. There were 3 apartments on the ground floor of the main house, one full apartment in each of the 4 bedrooms on the second floor, and 2 more apartments in the attic – a total of 9 apartments in the main house. In 1989, Duke and Nancy Waggoner purchased the house. After extensive renovations to return the home to it’s original plan, they opened it as The Fairview Bed & Breakfast. They operated it very successfully until retiring in 2000. That’s when Jimi & Vivian Ballard purchased the property. After doing more renovations and repairs over the period of about one year, they moved in with their daughter and Jimi’s mother. The Ballards made the house a home for their extended family for the next 15 years. After another extensive remodel and updating of the home, in September, 2014, Jimi & Vivian re-opened the new Fairview Bed & Breakfast.